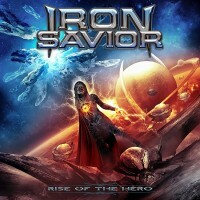 The German Heavy/Power Metal band IRON SAVIOR is still alive, no worries. It’s been four years since “The Landing” (see my review here), which came out four years after the preceding album, “Megatropolis” (see the review here). Whether or not this new album, “Rise Of The Hero”, which is to be released on the 28th of February 2014, continues the lyrical context of Science Fiction, as it has done since the self-titled debut album back in 1997, I can’t tell, since I don’t know. In any case, the cover art and some song titles might suggest that Piet did write a few songs in this context. The band’s eighth album contains a cover (“Dance With Somebody”, originally by MANDO DIAO) and a bonus track (only on the limited edition): a re-recorded version of “I’ve Been To Hell”, originally on the “Dark Assault” (2001) album. I’ve checked out the MANDO DIAO song on YouTube and the style is very mainstream and accessible. When I first saw the title, I instantly thought of Whitney Houston’s hit song, and that could have been interesting to turn into Metal. But alas… IRON SAVIOR’s rendition of the MANDO DIAO song may be fun to play from a musician’s point of view, but – depending on your taste – I found it rather mediocre. It’s too soft compared to the other songs, or, it’s not Metal enough, and it sounds very much out of place among the rest of the songs. On to the other tracks then, starting with the intro “Ascendence”. It’s a piece of electronic music, atmospheric, building to a climax that erupts into “Last Hero”, a song that is typical for IRON SAVIOR. Firm and powerful Heavy/Power Metal, with keyboards in the back. A melodic, hymnic bridge connects with the fullness of the anthemic chorus. All is flawlessly linked and played. The solo is set over halfway and is inline with the overall feel of the music. Afterwards it’s back to business and done. A very nice song to begin with, no doubt about that. Another highlight is “Revenge Of The Bridge”, which has more bite, sounds fiercer. And double bass. This song is even more IRON SAVIOR than the first one. The verses focus on bass, drums and vocals with the guitar bursting in now and then to enforce certain bits. Full force comes out in the bridge and the melodic, anthemic chorus. And that’s another characteristic: anthemic choruses. The guitar solo is this time a screamy one. “From Far Beyond Time” also shows that Piet and co. still know their Metal. It begins with bursts and screamy leads, joined by uptempo drums. The tempo is higher now and the music sounds great! While Piet’s singing is good, it seems he has lost some of his power and drive. The bridge and chorus are catchy as hell, while the solo is here as well rather wild, but classic. “Burning Heart” is a more accessible song, which takes off instantly. Yet it’s a firm and straight-forward song, where again the verses revolve around bass, drums and vocals. And the incoming guitar. A trick Piet has often applied in the past. The bridge is catchy, sounds 80s’ influenced in rhythm. The chorus is where full power and layered vocals do their thing. Time to push the pedal to the metal with “Thunder From The Mountains”: fast riffing, powerful music and pounding drums. Excellent! The singing sounds now fiercer than before, Piet’s throat has delivered more power. Rhythmically the song reminded me of SAVAGE CIRCUS, which is quite normal, as Piet has been in that band and written songs for the two albums. The solo is of the flashy kind. However, why is there no sound of thunder in the song? There is, however, a ripping sound, like a laser or electricity or similar. The list of highlights ends with the last track, “Fistraiser”, which is an uptempo Heavy/Power Metal song. And one of the many songs out there dedicated to Metal. This is getting boring, though. “Iron Warrior” is a good song, but not as good/strong as the preceding ones. It’s your typical IRON SAVIOR meets PARAGON meets GAMMA RAY kind of song, with an 80s’ feel. Continuing the same band comparison, now adding MANOWAR and HAMMERFALL, here is another slow(er) song: “Dragon King”. It’s ok, still acceptable. However, then you get that MANDO DIAO cover. Again, as said above, totally out of place. Luckily there’s “Firestorm” to bring back the Metal. However, why do I have the impression that the production is a little bit different, even more plastic than before? Last and very likely least, the power ballad “The Demon”, offering a mix of clean and distorted parts. Ballads never have been IRON SAVIOR’s strong point, but apparently they are a must on each album. Is it a marketing decision? Or a band’s decision? In any case, they’ve written better stuff in the past. “The Landing” was very much worth the while (and so are the first few albums), showing a band that still had the power to entertain and deliver the goods for several more years. And now “Rise Of The Hero” is ready. For die-hard fans of the band it’s a blind purchase. However, as much as I like IRON SAVIOR’s music, I find this new album a step back. The Heavy/Power Metal still has the IS-stamp, but overall the material just isn’t as enticing or interesting anymore, compared to the back catalogue. It could have been a very good EP, though, if only the highlights were kept.